First off, beer salt. It's a thing. Second, I have been using this stuff on everything, including dessert. Started in 2015, Walter Craft Beer Salt is made in small batches in California. I discovered them via Instagram a couple months ago and could not believe I didn't already know about this cool thing. I had to have some for myself. So yes, this is salt that is infused with beer. And not just any beer, good beer. All breweries are hand selected by Walter’s proprietress and if it is not good enough to drink, it isn't going to be good enough to become beer salt. They offer a few regular varieties including Hefeweizen, IPA, Porter, Tangerine Wheat, and Imperial Stout as well as limited edition varieties like Coffee Stout, Briney The Elder IPA, and the Brined Pig, plus a few flavor blends. They make a great finishing salt but I wanted to go further. Salted chocolate. Yeah, I went there. 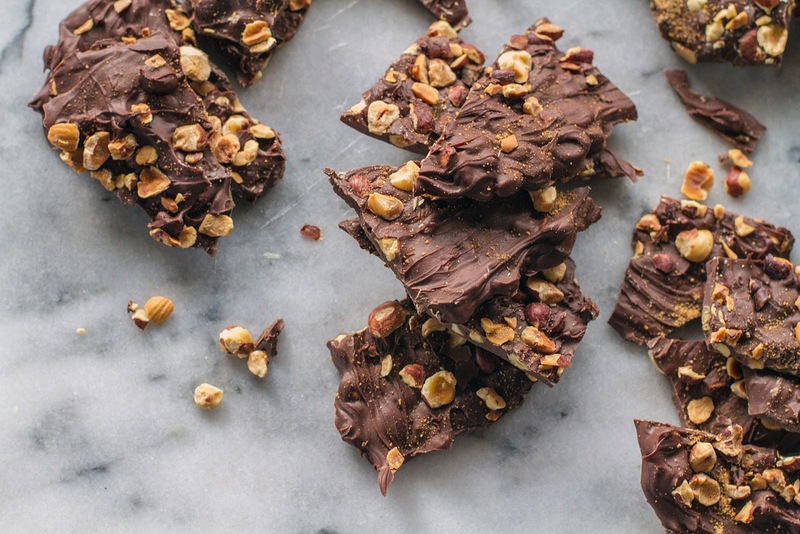 As I mentioned in my recipe for Chunky Cranberry Almond Dark Chocolate Bark, once you know the method for making chocolate bark the sky is the limit in terms of flavor combinations. 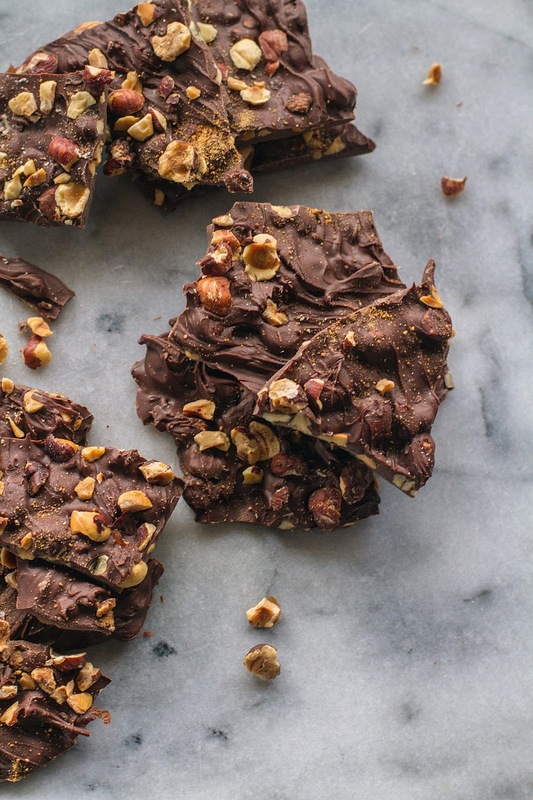 And, in fact, this bark recipe, is even easier. All you need are chocolate chips, toasted hazelnuts and tangerine wheat beer salt. The tangerine wheat flavor perfectly heightens the toasted hazelnuts and offers a touch of citrus brightness to the dark chocolate. I think it's a bit of a sophisticated twist on a ridiculously easy dessert. Got to love the holidays and rationalizations for making and eating dessert - every day. Place the chopped hazelnuts on a rimmed baking sheet and bake for 5 minutes or until lightly browned and fragrant. Transfer the nuts to a bowl and let cool. Line another rimmed baking sheet with parchment paper. Melt the chocolate either in the microwave or on the stove. Microwave method: Place the chocolate chips in a medium-sized microwaveable bowl (preferably glass) and microwave on high, stirring every 15 seconds, until the chocolate is melted. Stove method: In a small saucepan over low heat, bring about 2 inches of water to a low simmer. Place the chocolate chips in a small heat safe bowl (preferably glass) and set it over the pan of water. Stir the chocolate until melted, about 3-4 minutes. Using a rubber spatula, stir in ½ cup toasted hazelnuts. Spread the mixture onto the parchment-lined baking sheet. Sprinkle on top the remaining ¼ cup toasted hazelnuts and the beer salt. Gently press the toppings into the bark to adhere. Refrigerate 20 minutes or until the chocolate is firm. Break into pieces and serve or create individual packages to give as gifts. Keep refrigerated until ready to eat or give away. Wow! How easy is THAT? I'll be making a bunch to give away...if there's any left after I "taste" a few dozen chunks to be sure they are edible! !